Dungannon Swifts boss Kris Lindsay. 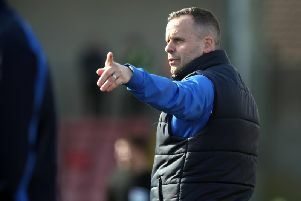 Pic by PressEye Ltd.
Kris Lindsay may have only had a short spell to date as Dungannon Swifts boss but long-term planning remains part of his thinking. A fourth game as Swifts boss last weekend provided Lindsay with a first Danske Bank Premiership point - now he turns his focus to cup football and an opportunity to also help the next generation. Banbridge Rangers visit Stangmore Park in the Euro Electrix Mid-Ulster Senior Cup tie tonight (Tuesday) and Lindsay is aiming to use the clash to increase his knowledge of the Swifts squad across all fronts. “The Mid-Ulster Cup is a senior competition and you always want to win games,” said Lindsay. “But we will look to freshen things up, with a few guys who need minutes then others from the under 20s who have been impressive. “We will go strong against Banbridge Rangers but cannot underestimate them and it is up to me to make sure the players’ attitudes are right. “I’ve had lots of conversations with Dixie Robinson about the youth players, plus managed to see two games with the under 20s and a few of the younger training sessions. “This past week we’ve had Oisin Smyth and Cahal McGinty confirm exciting futures at Dungannon, so it’s about continuing that progression. A well-earned 1-1 draw at high-flying Ballymena United helped Lindsay get off the mark in the league following two previous Danske Bank Premiership defeats. “The ‘goals scored’ column doesn’t make good reading for Dungannon, with eight scored in 11 league games,” said Lindsay. “That’s something we need to improve on but we’ve quality players. “If Daniel Hughes or Paul McElroy were a bit more clinical then we take that chance (on Saturday) and win the game, that’s the fine margin. “Daniel has been a good striker over his career so it’s about getting his confidence back up but he needs help from the rest of the squad as well. “It takes time for the players to get used to how I and my coaching staff work, plus me to find out about them. “Not having a game last week allowed us more time to get to know each other and work on the training pitch. “You could see in certain passages we played with a quality but a purpose as well. “The players are buying into it, with the signs pleasing from what is a relatively young squad. “We need to be a little bit more compact at present, offering a foundation to build.